I visited Charm Modern Thai in Yaletown for lunch today. I chose one of the Thai curry lunch plates ($7.50) that came with steamed rice, crispy prawn wonton and Tom Yum soup. I normally don't like fried foods, but I still enjoyed the crispy wonton because it wasn't overly oily. The tom yum soup was also pretty good, and just the right level of spiciness for me. 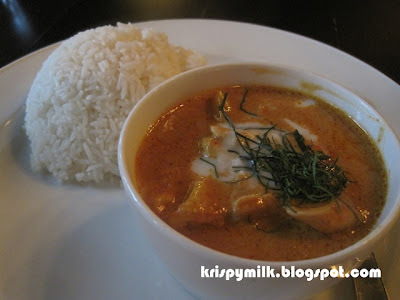 The matsaman curry was not bad either, but I found it to be less rich and fragrant than other curries I've tried. I noticed there was Thai iced tea ($3) on the menu and decided to get one to go with my meal. 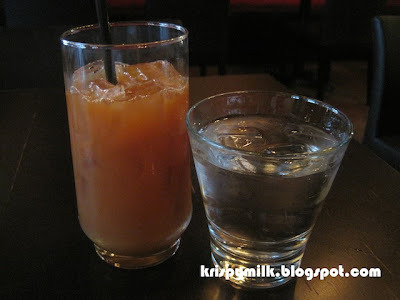 I fell in love with the drink ever since trying it at Mali Thai, but the iced tea here was disappointing. It tasted like it was watered down, and lacked the sweet and fragrant tea flavour. The glass was also quite small as seen in the photo below, and most of the glass was filled with ice. 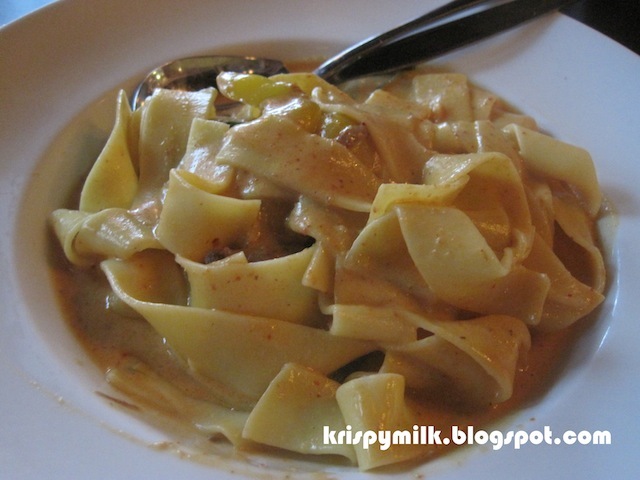 My mom ordered the Thai pappardelle ($10) which was described as "beef short ribs served on pappardelle noodles with a Thai basil red curry sauce". I didn't see any beef short ribs, so I guess they must be shredded or something. 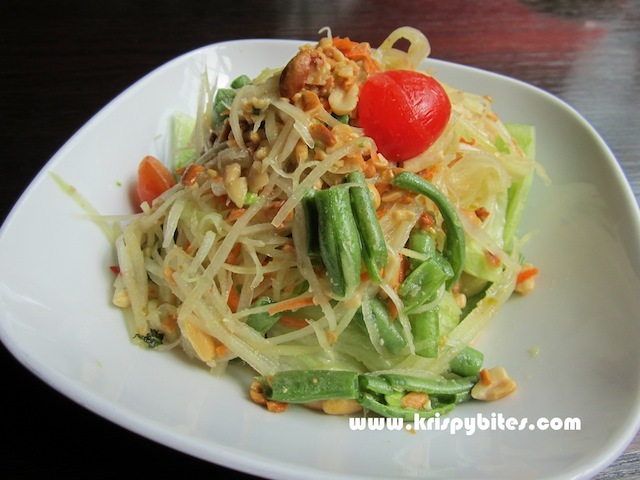 This dish is an East meets West combination of Thai curry and Italian pasta. The two went really well together. Dad got the pineapple fried rice ($10) which was not surprising as he's a fan of fried rice. The portion was much larger than expected. I can't really comment on the taste since I don't like fried rice, but I think it's a lot more sticky than normal. 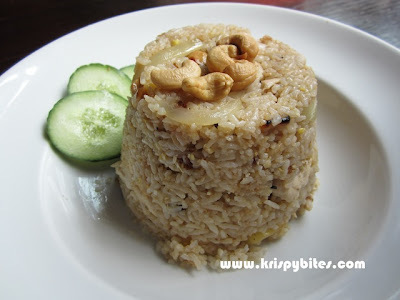 As you can see from the picture, the rice must be quite sticky to stay in that shape without collapsing. I had a pretty good lunch experience at Charm. The food was decent and the prices were reasonable. I would probably come back again if I were in the area. We visited Charm again and this time I was able to get better pictures. We ordered mostly the same items, but they were quite different from last time. 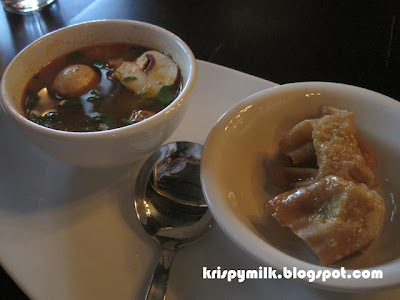 The tom yum soup was not much different, but the crispy prawn wonton was better than I remembered it. I got the matsaman curry ($7.50) again and when it came, I wondered whether I had ordered the wrong thing. 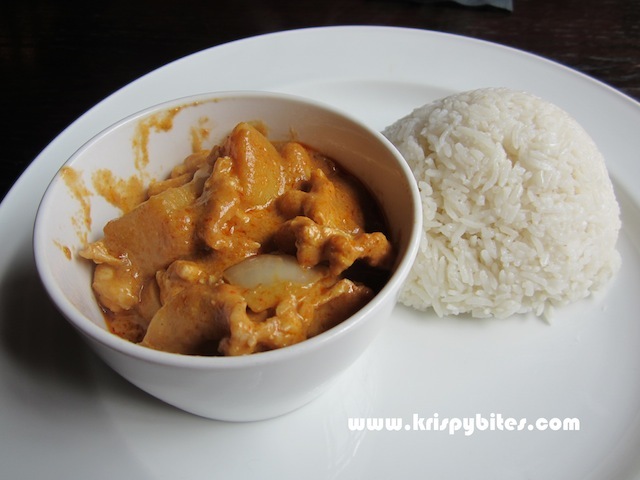 The bowl of yellow curry looked completely different (scroll up to compare). There was less sauce than last time and the colour was a lot darker. The curry had separated into a thick yellow paste and a watery red chili oil, but luckily it was a lot stronger and tastier than last time. Dad also ordered the same thing as last time: the pineapple fried rice ($10). The tomato slices were missing and the rice was even more sticky. 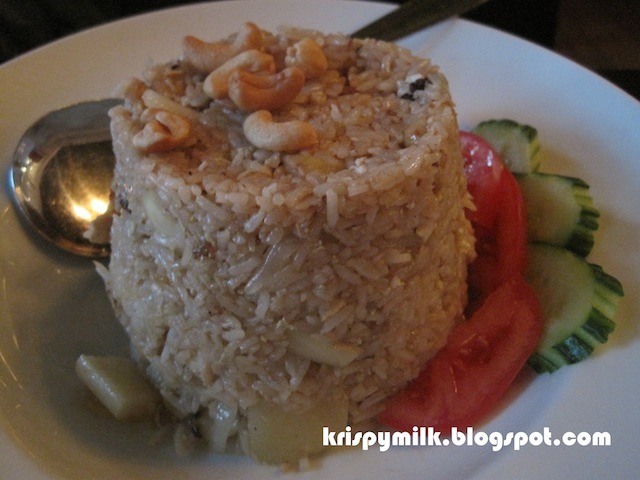 It was more like fried glutinous rice. Mom decided to try something lighter and more refreshing, so she got the papaya salad ($10). It was very salty and a bit too spicy for a salad. Not very refreshing at all. I only had one bite and didn't feel like having any more. 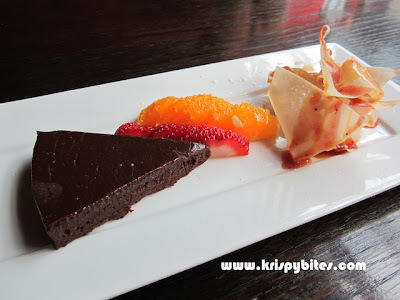 I had the chocolate chili torte ($4) for dessert, and the portion was not bad for the price. There was a little bit of fresh strawberry and orange, as well as crispy phyllo pastry drizzled with strawberry reduction. The torte itself was a bit on the sweet side, but luckily the spiciness balanced it out. It would've been nice to have more spice though, as the kick from the chili wasn't apparent until several bites into the cake. The curry and dessert were ok, but the fried rice and papaya salad were quite bad. The service was also a lot slower than the last visit. The waitress rarely came by to check on us, and several times we had to look for her to ask for something. I don't think I will be returning.